MONTEC realizes circuits for heat pumps, which are assembled using a procedure called brazing. The filler material, which varies depending on the metals to be joined, can be composed of a normal copper-phosphorus alloy, or with a variable percentage of 2-50% silver; penetration into the joint takes place using the principle of capillarity. 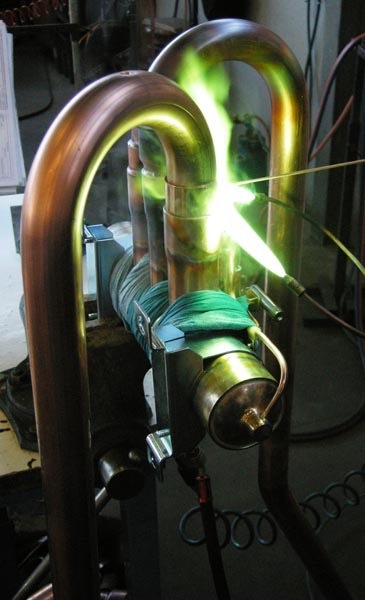 Because of the complexity of the circuits and the low production batches, brazing is performed manually by professional workers specifically trained and with many years experience. The terminals of the pipes are properly processed by shaping, widening or tapering: operations performed with computerized numerical control machines (CNC) equipped with specific equipment. Brazing is perhaps the oldest joining process of non-ferrous metals; actually this process evolved a lot, and the market offers alloys and fluxes for every type of brazing. MONTEC uses both the classic flame, and the inline gaseous flux called Gasflux for a better appearance and cleaning of the brazings.